Past Champ Interview: Cyclo-cross riders making an impression on the road isn't anything new. 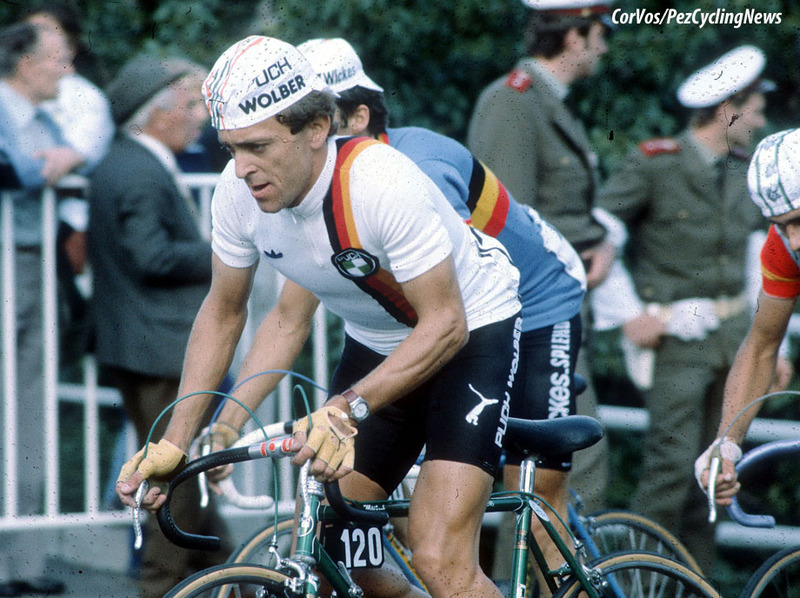 Back in the 70s, German 'cross champion Klaus-Peter Thaler jumped into the road scene and rode with honour in the Tour de France, Vuelta a España and the one-day races. Ed Hood managed to have a word with the near 70 year-old star of mud and tarmac. 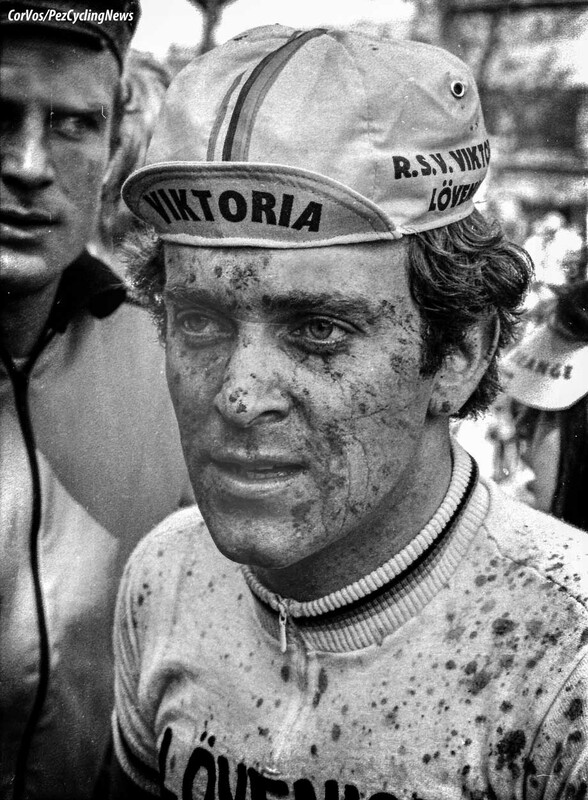 He was a National Champion on the road and in the mud; a World Champion over the latter – four times, twice as an amateur and twice as a pro. But as with the Wout Van Aert, Mathieu Van Der Poel and Van Der Poel’s father, Adrie before him, Germany’s Klaus-Peter Thaler wasn’t just a man of the winter. 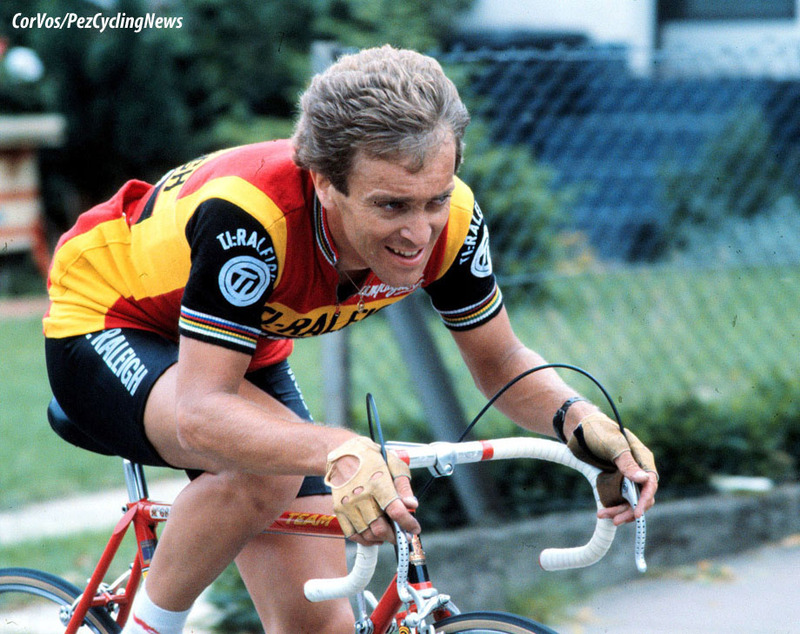 He took Olympic silver in the road race but was relegated to ninth – that one still hurts . . . 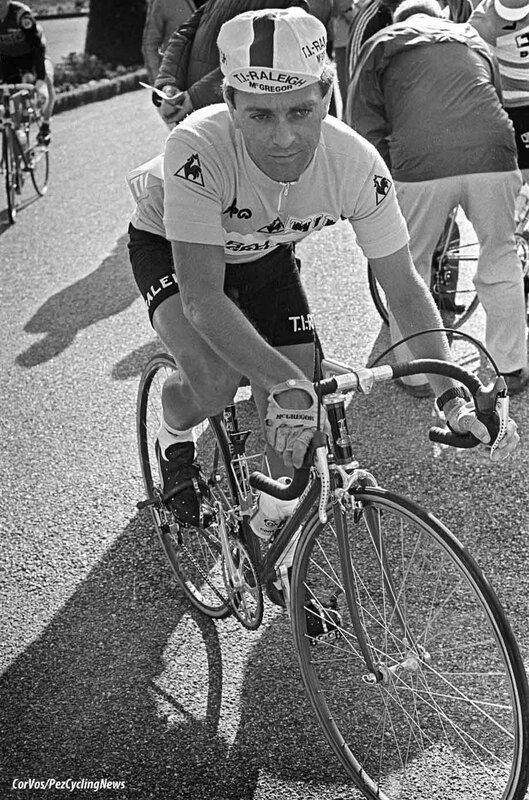 He stood on the final podium of the Vuelta in third spot in 1977, won stages and wore the maillot jaune in the Tour de France and was a frequent winner on the road. He took time to answer PEZ’s questions, recently. PEZ: Even as an amateur you mixed road and cyclo-cross successfully, Klaus Peter - But when did you take time to rest? Klaus-Peter Thaler: Well, that's the difficulty. After the World Championship Road Race in late summer I went some days on holidays riding only for fun and even several days without bike. 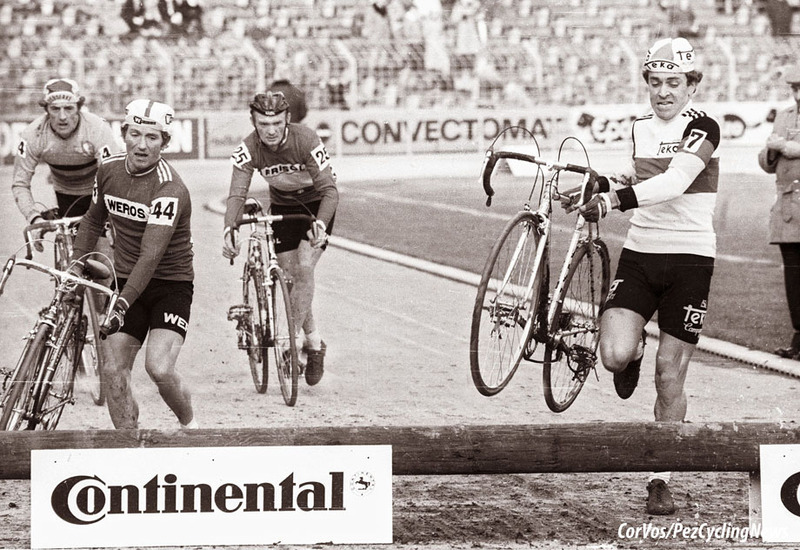 Then I started with the first cyclo-cross races. The ‘cross specialist were always some races ahead of me and it was always hard in the beginning of the season. But at ‘cross World Championship I was mostly in good shape. As a pro I worked in the same way. From the last cyclo-cross race I went directly on to the road. 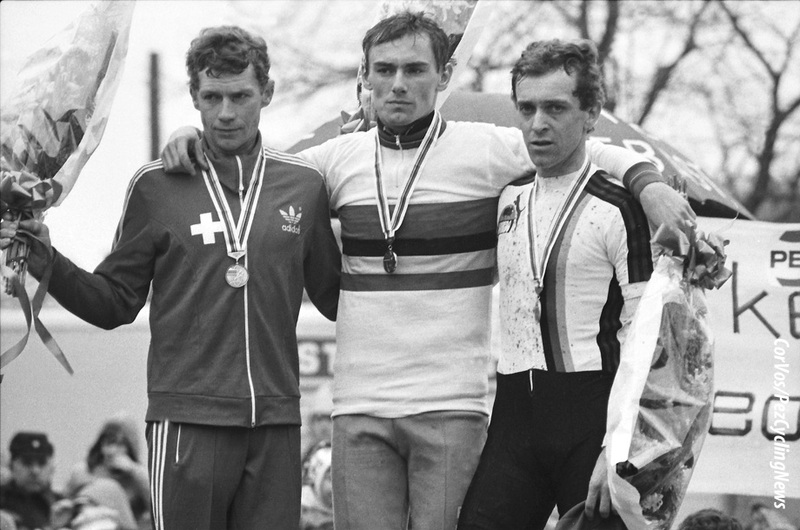 PEZ: You were World Amateur ‘cross Champion in 1973 but waited until after you won it again in 1976 before turning pro - why? The problem was in Germany that there were no pro teams and going abroad was very difficult. So I stayed too long as an amateur. 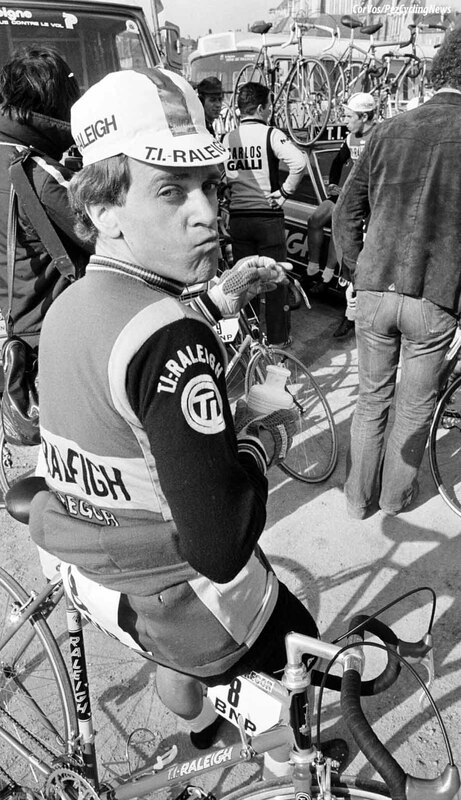 But in ‘76, after I took second place in the Olympic Road Race in Montreal behind Bernt Johanson then didn’t get any support from the federation against my being relegated to ninth place, I changed to pro at the age of 26 years. Normally that’s too late. PEZ: You turned pro for a Spanish team, Teka - an unusual choice for a German rider? My mentor Rolf Wolfshohl (former multiple National and World ‘cross Champion and Vuelta winner, ed.) organised a place at Teka because Teka was riding Alan bikes, the brand he was distributing in Germany. So I became member of the team and won directly the Tour of Levante in Spain and placed third overall at Vuelta España. PEZ: How did you find the transition from amateur to professional? Well, as amateur I was afraid about the long distances at pro races. But when I changed it was no problem to ride 70 or 80 km more in a race. I was impressed by the professional management around the time especially at TI Raleigh. 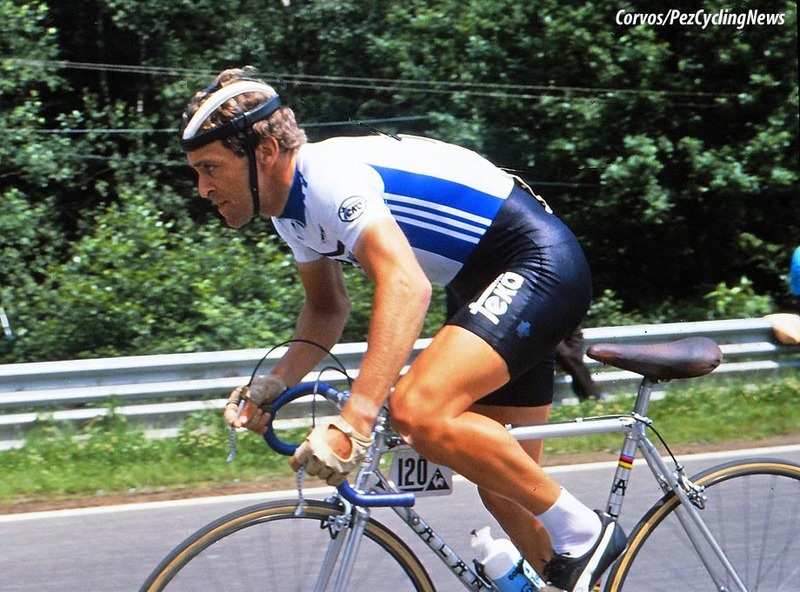 PEZ: You rode for Peter Post in '78 and '79 with Raleigh, please tell us about what working with him was like. Peter Post at that time was one of the most successful team managers. We had always the best riders in his team. I'm proud that I was for two years in the team and that I had the chance to ride in the yellow jersey for two days and score two stage victories. PEZ: What was Post’s attitude to your riding cyclo-cross in the winter? 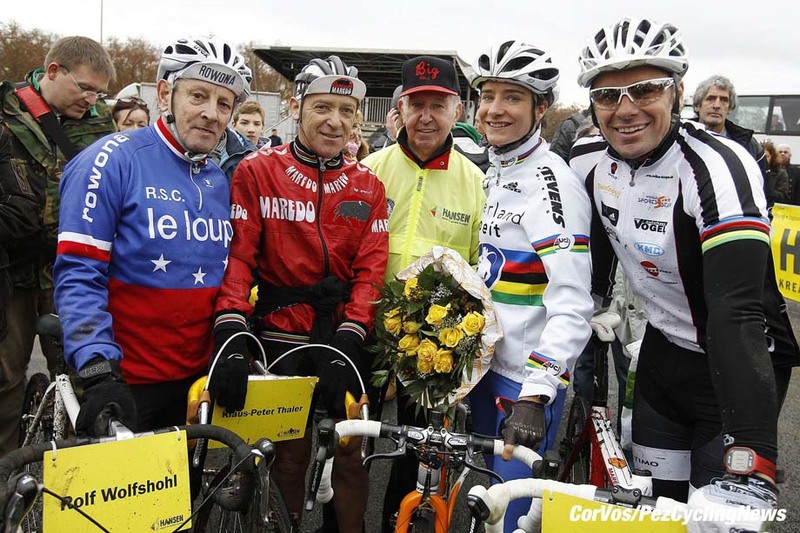 To have a top rider in cyclo-cross during the wintertime was always interesting for teams. So the sponsors’ names were to be seen on TV and in the newspapers out of the road season. 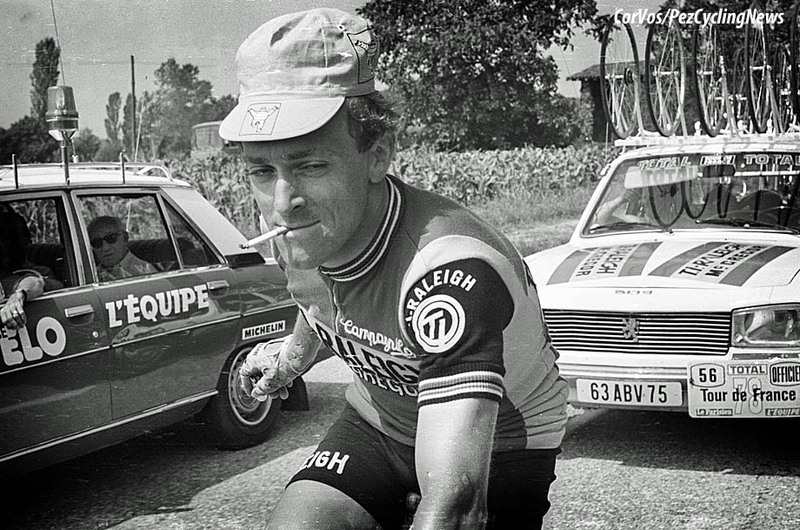 PEZ: The Tour de France maillot jaune in 1978, that must have been very special? Yes, that was only possible because TI Raleigh was a top team. In 1978 Jan Raas took the yellow jersey at the prologue, I received it some days later and Gerrie Knetemann took it from my shoulders. 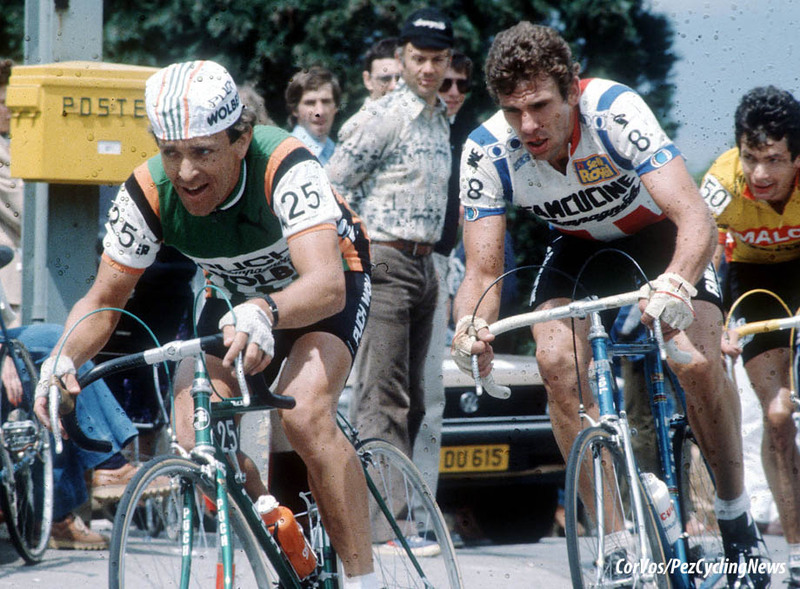 Hennie Kuiper should have won that Tour and he would have taken the jersey as fourth rider of the team. PEZ: Why go back to Teka in 1980? I left Teka because of the chance to ride for TI Raleigh. So when I left TI, Teka offered me a good contract and I went back to Spain. PEZ: Professional silver in the Worlds in 1980 behind Liboton; any "what ifs?" At that time I was chasing for the World Championship title as a professional, yes. But 1980 I was only second and 1983 third at Birmingham. Liboton was the strongest at the World Champs in Wetzikon so no, ‘what if’. 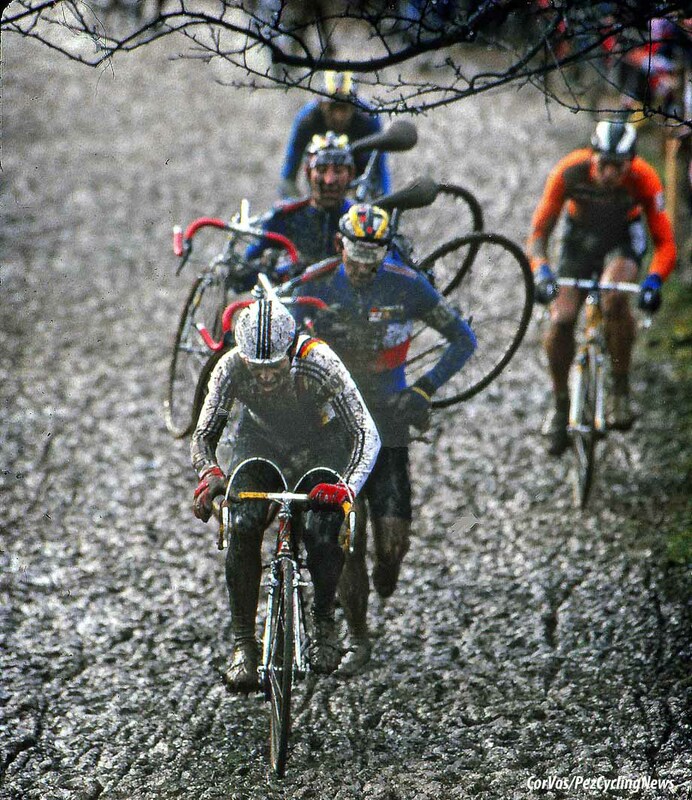 PEZ: You rode in an era of great 'cross riders: Liboton, Van Der Poel, Richard, De Bie, Zweifel who did you respect most? Liboton and Zweifel were the ones most respected from my side because of their long successful career. PEZ: You were with Puch '81 and '82 was that a good part of your career? I was an interesting part. 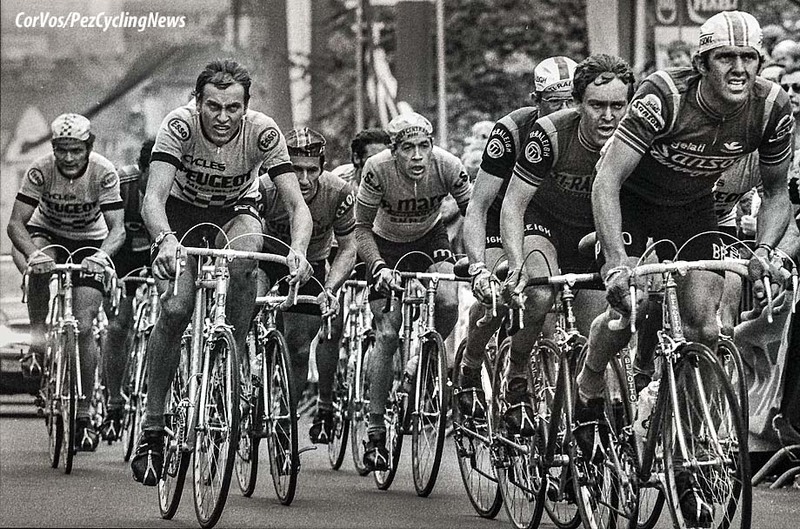 The problem was that the French Puch Wolber team and one year later the Swiss Puch Eurotex team were badly organised. At the end of season 1982 I left the team before the World Champs at Goodwood in England where I finished seventh. The rest of the season I had my individual sponsor. PEZ: Then Maredo for the next four years, tell us about that team, please. Maredo was not a team, they sponsored me as an individual. I knew quite well the CEO of this steak house company and when I asked him for sponsorship he said ‘okay.’ Even during the two years 83/84 I worked as coach of the national team and wasn’t racing so much I had the right to eat at the Maredo restaurants all over Germany with whole team. 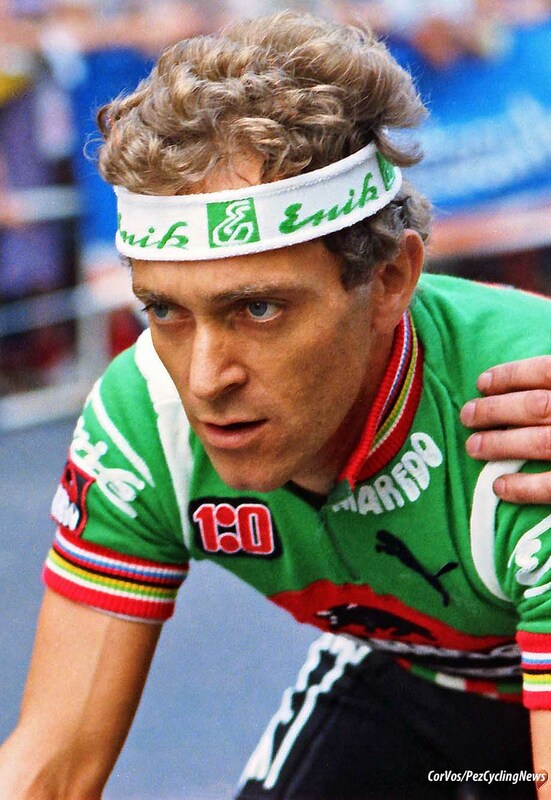 And more important; when I started my comeback in ‘85 - which was a risk with no guarantee of success - Maredo gave me the chance to ride again in the white/red/black jersey with the bull on it. 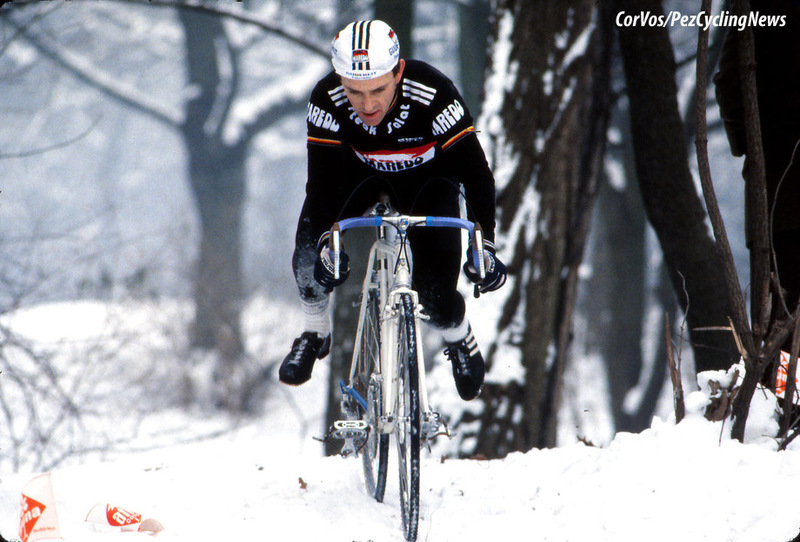 PEZ: Winter 1985 in the snow at Munich, your first professional world title, nine years after your last, that must have been special? Munich was great. After only eight weeks of training but in a harder way than ever, I had a wonderful race. It was slippery and cold what I liked very much. I attacked at the last climb just before a fast short downhill and entered the stadium with some seconds in front. A great moment. 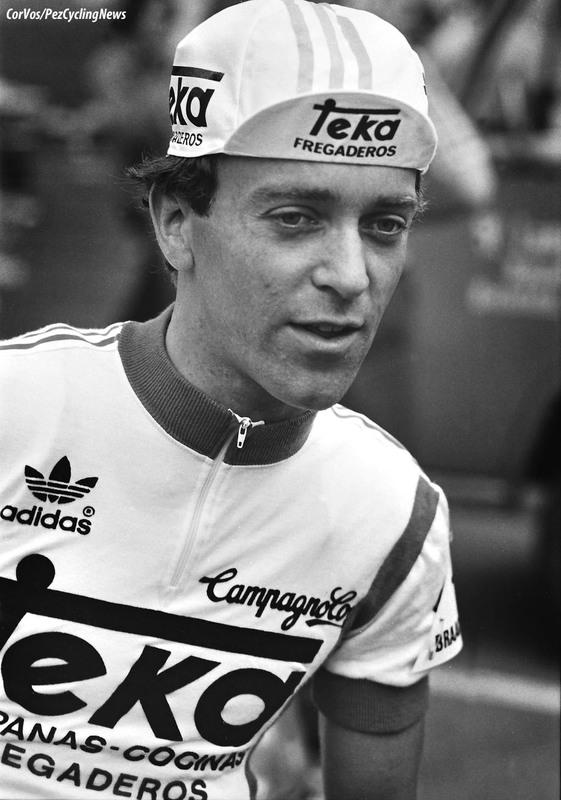 PEZ: Then champion again in '87 - what are your memories of that day? Yes, people said, Munich ‘85 was only luck. Liboton had a problem, Stamsnijder crashed and so on. But when that happened I was already far ahead with Van der Poel and Michely. So ‘87 for me was the victory that showed that Munich was not a one night stand. 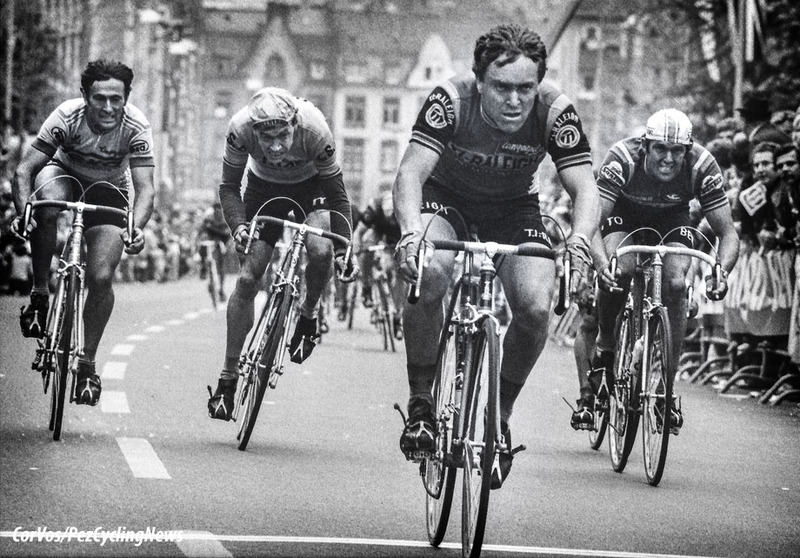 Weather conditions were similar to Munich race but with Danny De Bie I had a strong rival for the whole race. And like 85 at Munich ceremony I was crying on the podium. To become World Champion at the age of 37 is really rare. I was overwhelmed. PEZ: American Airlines was the name on the jersey in 1988? KPT: After the years with the Maredo jersey I found a new sponsor American Airlines. Only a one year contract till the end of my career. PEZ: How many 'cross races did you win during your career? I don't know, I never listed them. PEZ: If you had to name one hi-lite? Two! 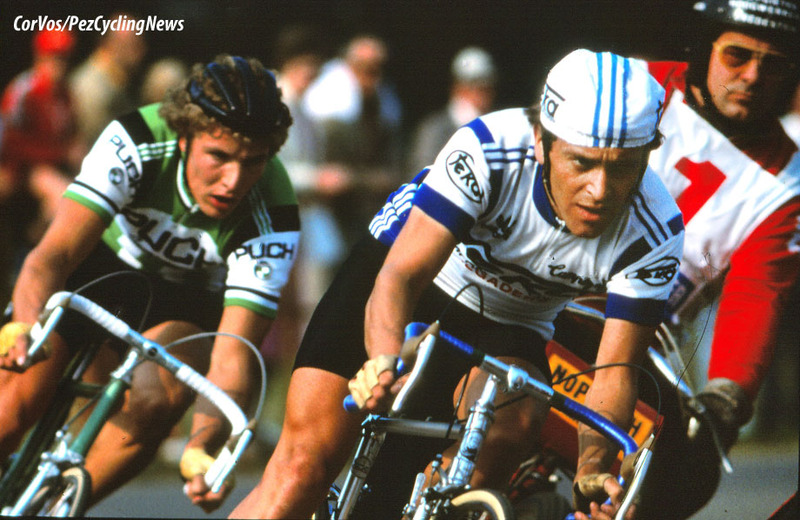 – the Tour yellow jersey in ‘78 and the World Championship in Munich ’85. PEZ: Any regrets or things you wish you had done differently? Yes, I should have changed to the professionals four years earlier than I did. PEZ: What is life like for you now? Next month I will reach the 70 years hurdle. I'm still riding my bike three times per week, sometimes the original bikes from ‘78, ‘80 and ‘82. I took part several times at Eroica Italia and this year again at Eroica Germania. I like my old cars and spend a lot of time with my four grandchildren who are living nearby. For some weeks, in total half the year, I'm living with my wife in Corsica.